American cockroaches are most comfortable in hot and steamy tunnels, aka New York this week. The aroma of steamy garbage isn't the only thing that will be filling the air in this week's oppressive heat and humidity. Apparently, a delightful side effect of New York City in the summertime is that it's the perfect weather for inspiring American Cockroaches to take flight, experts said. “In hot steam tunnels, something with the temperature and the humidity encourages them to fly,” said Ken Schumann, an entomologist at Bell Environmental Services. “When it's warm and steamy that seems to be what they like." The American Museum of Natural History's resident bug expert, Louis Sorkin, added that "with more heat they have more use of their muscles." "The more activity, the more flight," added Sorkin, who has spotted flying roaches in the museum's basement. And roaches have a distinct way of taking to air. American Cockroaches are more frequent fliers in southern states such as Florida and Texas, where the bugs are colloquially referred to as palmetto bugs, for their habit of hanging out on palm trees. They're also more suburban and rural creatures there, and use their wings more regularly to travel for food. On the other hand, New York City's density of trash cans and ample food supply for street roaches has had the gratitude-inducing side effect of cutting down on roach flight here, said Rich Miller, owner of Broadway Exterminating, with 50 years experience in the business. “As the evolution occurred, their wings became and less important to them. There’s so much food around,” he said. “They don’t use their wings like they used to." While Miller said he'd known roaches to fly as long as a city block, most experts agreed that American Roaches in New York City are more apt to glide from a higher spot to a lower one. "Compare a bird to a chicken," said Hao Yu, another resident entomologist at Bell Environmental Services, adding that roaches aren't "true fliers as you would define a bee or a dragonfly." Still, Yu said, that doesn't stop them from using their wings if they're trying to avoid a predator, if they're seeking food or trying to get closer to a potential mate. 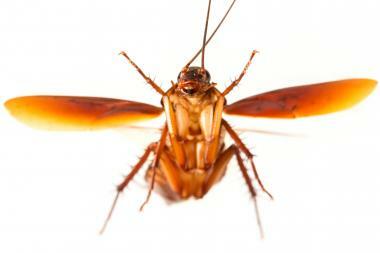 While heat can encourage more roach flight, Gil Bloom, an entomologist at Standard Pest Management, had another explanation based on personal experience. "Have you ever gone down in a basement and shined a flashlight?" he said. "They fly because they can."